Reflector 1.3.3 is running seamlessly on Windows 8 and Windows 8.1. Reflector is an AirPlay receiver which connects iPods, iPads and iPhones to computers and projector. Reflector mirrors your device on a big screen without wires or complicated setups. There is both an Windows PC version and Mac OS X version available. After opening Reflector on your PC or Mac, you just need to start the AirPlaying mirroring on your iPhone or iPad. Squirrels, the makers of Reflector, released Reflector 1.3.3 update for PC in November 2013. Beside Reflector, Squirrels developed also AirParrot, an app to AirPlay a computer’s screen to Apple TV. The last version I tested was Reflector 1.2.3 on Windows 8. The result was disappointing, both the AirPlay mirroring and the video screen capture did not work. Now I checked Reflector 1.3.3 on my Acer Aspire 1810T running on Windows 8.1 Pro. First you need to start the AirPlaying mirroring on your iPhone or iPad as you can see in the following video. Sometimes is takes some seconds until the Airplay connection is set up. In contrast to the predecessor versions, Reflector 1.3.3 is working seamlessly without any stopping, freezing or loosing connection on Windows 8.1. The response time is near by zero. Finally, the makers of Reflector, Squirrels, made a a good job. 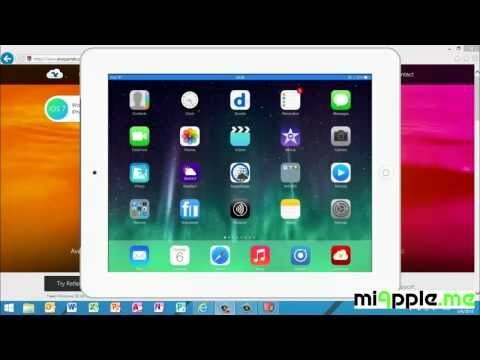 On my YouTube Channel miApple.TV you can also watch this video “Airplay: Reflector 1.3.3 Running On Windows 8.1“, conducted with an iPad Air cellular (128 GB). Reflector 1.3.3 is running on Windows 8 and Windows 8.1. The AirPlay mirroring works perfectly, but the video screen capture option is now missing. Now I can recommend Reflector for Windows for user who want to mirror their iPhone’s, iPod’s or iPad’s screen to a Windows PC. Tip: Check the trial version of Reflector on your Windows PC before purchasing it! What are you findings about Reflector? Do you have the need for such an app? Let us know and comment!